Maggie and I went to see a film last night called Blind Sunflowers (Los Girasoles Ciegos). I understood enough of the Spanish dialogue to know it was tedious. We met one of Maggie's work colleagues at the cinema and we walked her home - I was glad that Maggie did the talking as I fluffed most of my lines, short as they were. When we got home there was a Woody Allen film on the telly. Woody was hesitating and repeating as he should but, dubbed into Spanish, it wasn't quite the same. The cats are hiding under the bed still; disoriented. I have spent several hours talking to my new employers about the various classes I will be teaching. The number of teaching hours keep increasing and things are looking good but the wealth of detail has been a little overpowering. Stranger in a strange land syndrome. Gusa and Adel, the owners of the Dublin School of English have made a superb choice and employed me as an English teacher. Their language school is based on the top floor of one of the oldest buildings in Ciudad Rodrigo in the very centre of the town. So, from 1st october I'll be working there and I must say that I'm really looking forward to it. I'm looking forward to living in such a "Spanish" place, being back with Maggie and with the idea of dealing with language - something I find infinitely interesting. There are basically six roads out of Ciudad Rodrigo. One goes to the Hurdes, one to Extramadura, one to Salamanca, one to Portugal, one to Lumbrales and one to Bejar. The Sierra de Francia (see the last post) is on the road to Bejar. Salamanca is about 90kms from Ciudad Rodrigo but, because of the motorway, it's actually faster to get there than it is to, say, San Martín de Castañar. 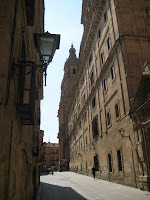 Salamanca is an important city even though, population wise, it's quite small. A big university and eclesiastical centre with some extremely impressive buildings. Surprisingly lots of tourists head for Salamanca and then come on to Ciudad Rodrigo rather than doing it the other way around! Over the weekend Maggie and I popped out for a bit of a drive. We went to the Sierra de Francia, about 50km from Ciudad Rodrigo, and where there are a number of villages that look remarkably mediaeval. 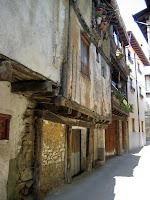 The pictures are from a village called San Martín de Castañar. There are lots of others that look similar: winding cobbled streets, half timbered houses, ruined castles, big defensive churches and lots of greenery. Not quite like Alicante. Maggie is now back in Ciudad Rodrigo for the start of another academic year. She has moved into her flat and I'm here too for a few days to sort out my new job at the Dublin School of English. I have to go back to Culebrón to see if I can put the house back together before starting work at the beginning of October. We went out with a couple of Maggie's pals on Saturday evening. There just happened to be a theatre festival going on in town - there seems to always something going on in Ciudad Rodrigo as far as I can tell. 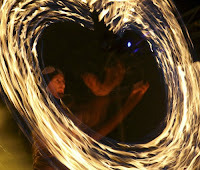 The show we saw involved six or seven men dancing and juggling and playing with fire on a stage that doubled as the backdrop for a video projection and firework launchpad. This special event, though, did not interfere with the general flow of the evening which started with a drink and a snack, progressed through quiet bars to noisier bars, obligatory tequila and general rowdiness. We are two Britons living in Spain. 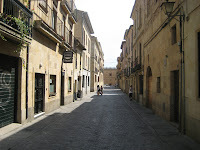 This blog records our time in Ciudad Rodrigo. More current blogs in the same series are Life in La Unión, Life in Culebrón and Life in Cartagena which can be accessed via the tabs above. 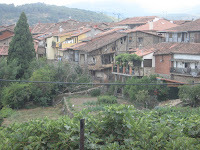 La izada del pino por los quintos.